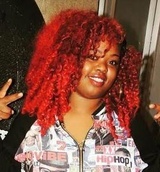 Posted Dec. 22, 2016, 3 a.m.
Posted Aug. 5, 2016, 11:33 a.m.
Dickerson, a Compton native, was an aspiring rapper who worked for a security company, the barbecue stand and Mom’s Burgers in Compton, said her mother, Valarie Holyfield. Dickerson, described as a caring and gentle person, was the oldest of six children. “She was just a go-getter,” Holyfield said. Inspired by the 2004 shooting death of her brother, 15-year-old Harvey Dickerson, Jennifer Dickerson began writing songs to express herself. "She found her way of releasing her emotions through her music," Holyfield said. Anyone with information is asked to call Harbor Division detectives at (310) 726-7887 or (310) 726-7880. Those who wish to remain anonymous can call Crime Stoppers at (800) 222-8477. — Crystal hull March 6, 2018 at 8:30 a.m.
— Porsche June 30, 2017 at 8:49 a.m.
— syscom3 Dec. 22, 2016 at 11:44 a.m.
— Auntie Melinda Dec. 22, 2016 at 8:21 a.m.
— Valarie holyfield Dec. 22, 2016 at 7:42 a.m. I love you forever and you'll always be a piece of me! — Joyce Dickerson Sept. 9, 2016 at 6:20 p.m.
— Melissa Aug. 31, 2016 at 6:11 p.m.
— sadnews Aug. 21, 2016 at 5:28 p.m. I met Jennifer a few years ago. She was a motivated young woman with dreams and a heart as big as California. She worked very hard on her music and wanted to use it as a bridge to create opportunity for her community. She worked and traveled and was always supportive of other people chasing the same dream. She was an extreme pleasure to be around. Her huge smile was infectious and she will be sorely missed by the thousands of people she came in contact with and touched with her spirit. My condolences go out to her mother, family and friends. I just want them to know, if they didn't, how wide her reach was. — Courtney Carroll Aug. 5, 2016 at 3:32 p.m.